It’s the 1941 anniversary of the Japanese attack on the US Naval Base at Pearl Harbor (and the return to Hawaiian shores by 104 year old survivor, Ray Chavez). It’s the date on which first state, Delaware, ratified the US Constitution in 1787, NY Philharmonic’s first concert in 1842, when Otis Redding recorded “Sittin’ on the Dock of the Bay” in 1967, and Bo Jackson won the Heisman in 1985. It may also be the day the US stock markets began a new break out. You’ll get no argument from me that the US stock markets are not cheap in general. Heck, analysts and investors alike have been yelling for the past two years that major correction is right around the corner. There are certainly several significant global macro uncertainties that could ignite a major sell-off. Yet the fact remains that on December 7th, 2016 the Financial, Industrial and Transportation sectors all rallied. Historically this has been a very bullish signal. The sell off that brought so much fear to many to start this year seems like a distant memory. Back then I penned several pieces comparing that sell off to the sovereign debt scare of 2011. Interestingly, when you overlay the S&P500 chart for the last two years with its chart from Sept 2010 to Sept 2012 they appear like a mirror image of the other. 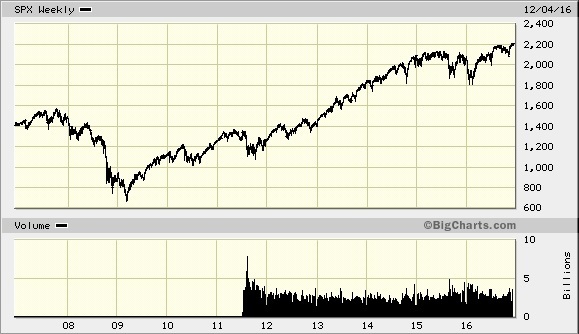 US stock markets had a two month dip in Oct and Nov 2012 before experiencing a big rally in 2013. Like then, we have historically high amounts of cash on the sidelines, overwhelming number of analysts forecasting a sell off, assets feeling bonds into stocks and questions about the stability of European finances. While the concern over Italy’s banking sector sounds like a replay of 2011, it is a real risk today. Maybe it turns out to be the harmless factor it was to the stock markets then or maybe it is the same problem as then only exacerbated. On the flip side consumer confidence and purchasing manager index readings are much stronger today. Too many investors missed out on the rally of 2013 and they could be in store for a redux, but just like then, potential bombshells exist that could change the picture quickly. I’ve found in uncertain times, risk management is paramount to investment success. Reach out to us at www.IntegrousInvesting.com to learn more about managing your investment risks. The S&P 500 Index is a widely recognized index including a representative sample of 500 leading companies in leading sectors of the U.S. economy. This index is unmanaged. Investors cannot invest directly into indexes. Past performance does not guarantee future results. ← Life Insurance. What’s In It For My 20-Something Year Old Self?